Why Be Concerned with Hay Waste On Horse Farms? Large round- and small-square bale hay feeders were evaluated during two separate studies. Nine round-bale feeders, were tested, including the Cinch Net ($147; Cinch Chix LLC), Cone ($1,195*; Weldy Enterprises; model R7C), Covered Cradle ($3,200; SM Iron Inc.), Hayhut ($650; Hayhuts LLS), Hay Sleigh ($425; Smith Iron Works Inc.), Ring ($300; R & C Livestock), Tombstone ($250; Dura-Built), Tombstone Saver ($650; HiQual), Waste Less ($1,450; JSI Innovations LLC), and a no-feeder control (Figure 1). Twenty-five mature horses were used to form five groups of five horses. Each feeder was placed on the ground in an outdoor dirt paddock. The groups of horses fed in rotation for four days, and every fourth day, groups were rotated to a different paddock. Waste hay (hay on the ground outside of the feeder) and orts (hay remaining inside the feeder) were collected daily. Percent hay waste was calculated as the amount of hay waste divided by the amount of hay fed minus orts. The number of months to repay the feeder cost (payback) was calculated using hay valued at $200/ton, and improved efficiency over the no-feeder control. 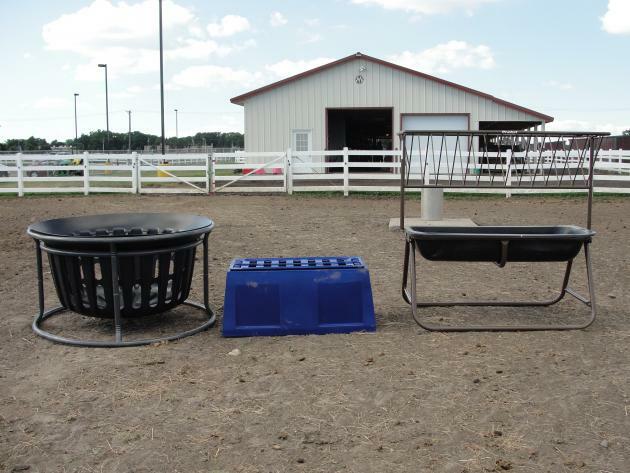 Three small square-bale feeders were tested, including a hayrack ($280; Horse Bunk Feeder and Hay Rack, Priefert Manufacturing), slat feeder ($349; The Natural Feeder), basket feeder ($372; Equine Hay Basket, Tarter Farm and Ranch Equipment), and a no-feeder control (Figure 1). Two feeders of each type were placed in separate, outdoor, dirt paddocks. Twelve adult horses were divided into four similar herds of three horses each and were rotated through the four paddocks, remaining in each paddock for a period of seven days. Grass hay was fed at 2.5% of the herd bodyweight split evenly between two feedings. Waste hay (hay on the ground outside of the feeder) and orts (hay remaining inside the feeder) were collected before each feeding. Percent hay waste was calculated as the amount of hay waste divided by the amount of hay fed minus orts. The number of months to repay the feeder cost (payback) was calculated using hay valued at $200/ton, and improved efficiency over the no-feeder control. No injuries were observed from any feeder types during the data collection period. Hay waste differed between round-bale feeder designs. Mean percent waste was: Waste Less, 5%; Cinch Net, 6%; Hayhut, 9%; Covered Cradle, 11%; Tombstone Saver, 13%; Tombstone, Cone and Ring, 19%; Hay Sleigh, 33%; and no-feeder control, 57%. All feeders reduced waste compared to the no-feeder control. Feeder design affected payback. The Cinch Net paid for itself in less than 1 month; Tombstone and Ring, 2 months; Hayhut and Tombstone Saver, 4 months; Hay Sleigh, 5 months; Waste Less, 8 months; Cone, 9 months; and Covered Cradle, 19 months. Hay waste was different between small square-bale feeder designs. Mean hay waste was 1, 3, 5 and 13% for the slat, basket, hayrack and no-feeder control, respectively. All feeders resulted in less hay waste compared with the no-feeder control. Feeder design also affected payback. The hayrack, basket, and slat feeders paid for themselves in 11, 10, and 9 months, respectively. Grev, A.M., E.C. Glunk, M.R. Hathaway, W.F. Lazarus, and K.L. Martinson. 2014. The effect of small square-bale feeder design on hay waste and economics during outdoor feeding of adult horses. Journal of Equine Veterinary Science. 34: 1,269-1,273. Martinson, K., J. Wilson, K. Cleary, W. Lazarus, W. Thomas and M. Hathaway. Round-bale Feeder Design Affects Hay Waste and Economics During Horse Feeding. 2012. J. Anim. Sci. 90: 1047–1055. The large round-bale feeder research was funded by a grant from the MN Horse Council and manufacturer fees. The small-square bale feeder research was funded by a grant from the American Quarter Horse Foundation.